This feature reports sugar used (dry and liquid) in Part IV – Summary of Materials Received and Used of the TTB Report of Wine Premises Operations in vintrace. Firstly, you need to setup a tax class for dry sugar in Winery Setup – Setup Options – Policy – Tax Class. Click on New Tax class button. 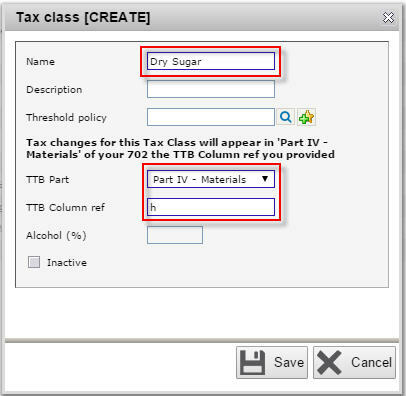 Give the Name, TTB Class ref, and select Part IV – Materials in TTB Part where this tax class will get reported in the TTB report. Input “h” in TTB Class ref. Any TTB event for this tax class will get reported under the corresponding column in Part IV of the TTB report. In the example below, we have entered “h” in TTB Class ref and this tax class will get reported in Part IV column (h) in the TTB report. Unlike the other materials (grapes, juice, and concentrate) in Part IV of the TTB report, sugar will be handled as an additive in vintrace. You need to setup a new additive by going to Winery Setup – Production – Additive. 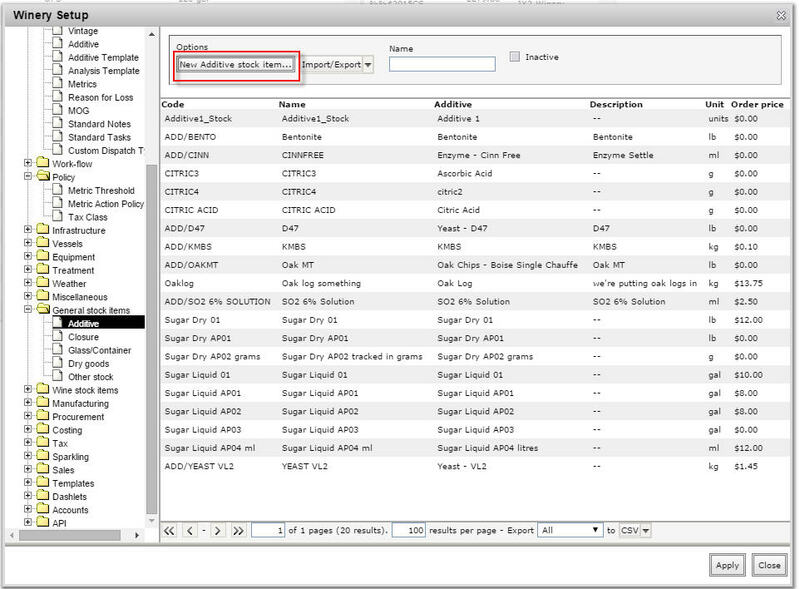 Click on New Additive… button. For more information on how to setup new additives, refer to this article. 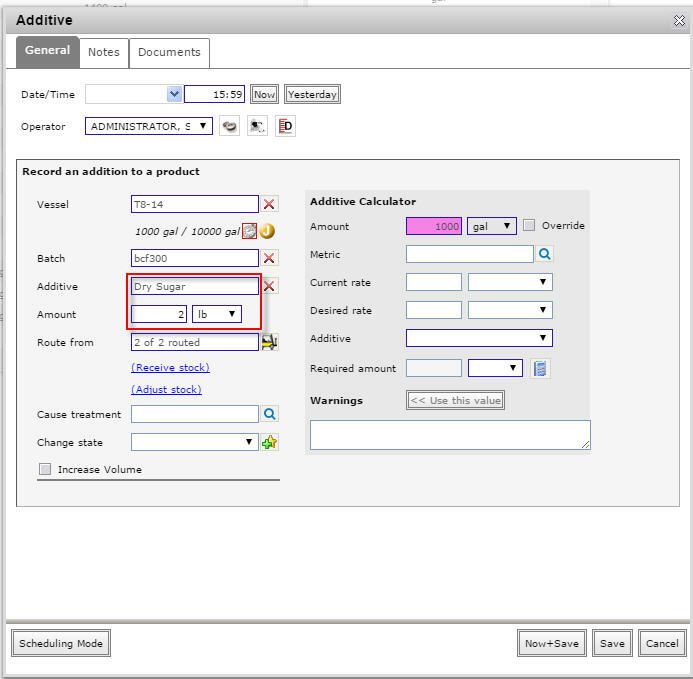 Provide the Name, Unit of addition, and Owner for the dry sugar additive you want to setup. Click on Save button. 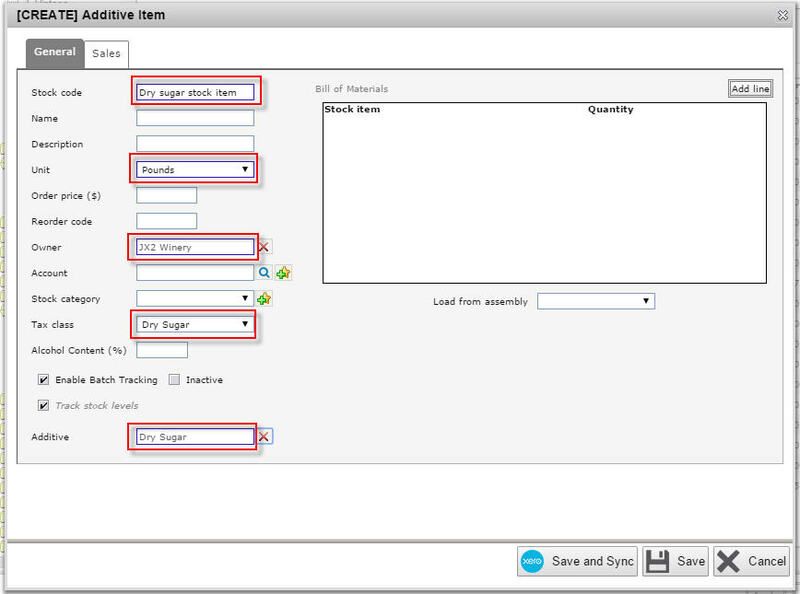 Setup an additive stock item to link to your dry sugar additive by going to Winery Setup – General stock items – Additive. 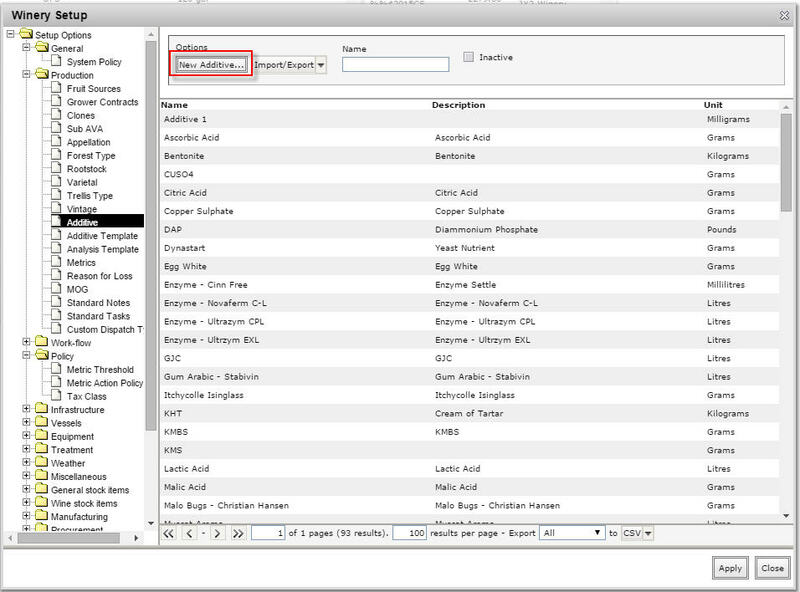 Click on New Additive stock item… button. 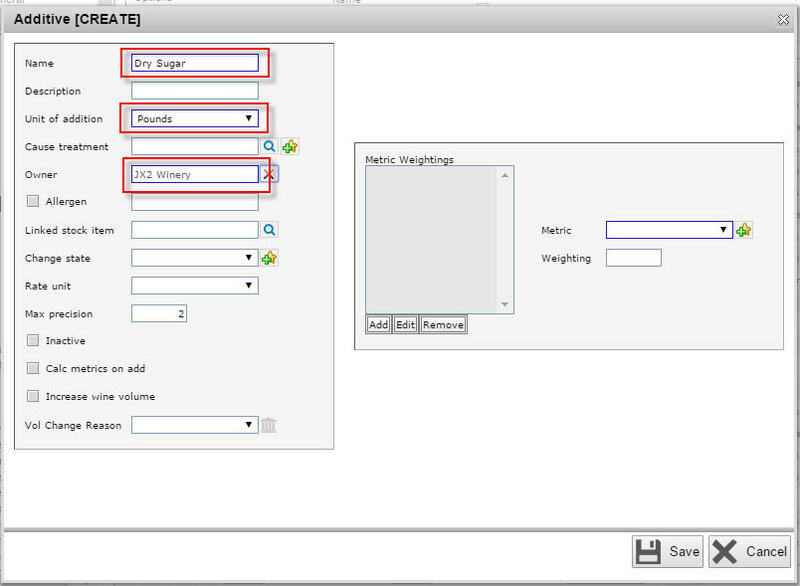 Enter the Stock Code, Unit, and Owner, select the Tax class “Dry sugar” that was created in the previous steps, and select “Dry Sugar” in the Additive field to link this to the additive created previously. 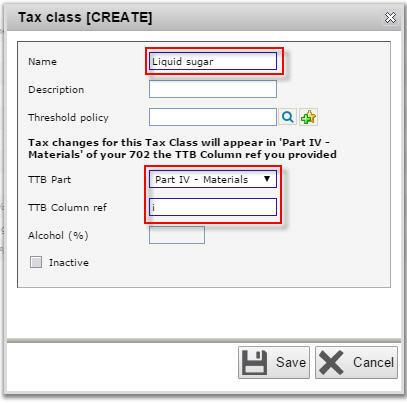 It is very important that you select the correct tax class so that the sugar used will be reported correctly in the TTB report. To receive sugar into your inventory, go to Inventory – Receive. 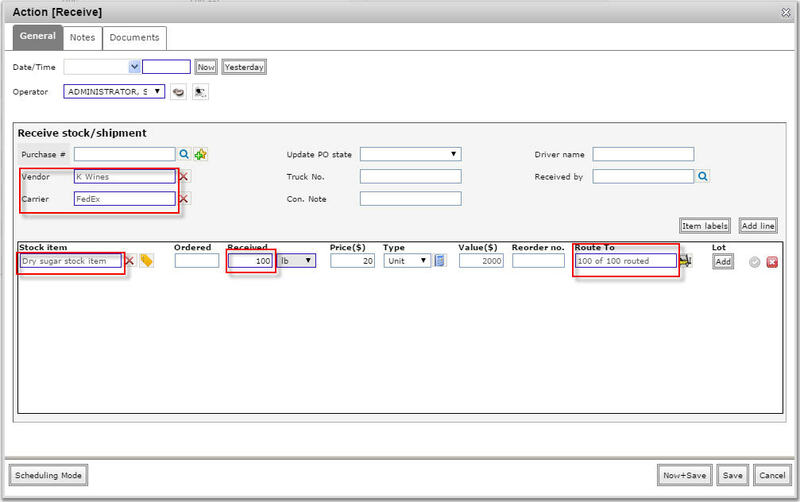 Enter the receival details such as the vendor, carrier, stock item, received units, and routing information. The stock receival done in the previous step is reported in Part IV row 2 Received column (h) in the TTB report. You can add dry sugar to your wine like any other additive by performing additive/multi addition operation, or as an inline addition in any of your transfer/blend operations. In the example below, we have added dry sugar to wine by performing an additive operation. After the additive operation, the dry sugar used will be reported in Part IV row 5 Used in Wine Production. Input “i” in TTB Class ref. Any TTB event for this tax class will get reported under the corresponding column in Part IV of the TTB report. In the example below, we have entered “i” in TTB Class ref and this tax class will get reported in Part IV column (i) in the TTB report. Setting up additives for liquid sugar is the same as dry sugar, just make sure you specify the Liquid sugar in the tax class of the liquid sugar stock item. Using liquid sugar is the same as dry sugar by using it in any addition operation.